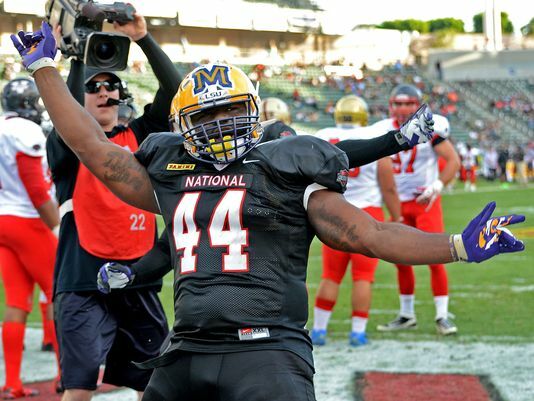 Former LSU fullback J.C. Copeland was an man among boys at the NFLPA Collegiate Bowl. He rushed for two touchdowns and was named the game MVP. James Franklin-QB-Missouri (6-2 230 lbs. ): Has a strange throwing motion. At times he is flat-footed and he isn’t real fluid. His front foot is stiff on the follow through. Had shoulder problems during his career. Did not look comfortable. Completed 5 of 8 for 77 yards and 1 INT. Ran twice for 4 yards. Kenny Guiton-QB-Ohio State (6-2 200 lbs. ): Was mostly a backup at Ohio State, but did very well in the games that he played when Braxton Miller was injured. Good leadership qualities, was elected a captain even as a backup. Very confident with good football IQ. Good accuracy. Completed 1 of 4 for 9 yards. Sean Schroeder-QB-Hawaii (6-1 189 lbs. ): Lacks size most NFL teams like. Rhythm passer. Willing to dink and dunk and take what the defense gives him. Moves the chains, but doesn’t attack the defense. Great timing. Struggles on deep passes. Was the most effective QB for the American team. Completed 13 of 17 for 138 yards and 1 TD. Caleb Herring-QB-UNLV (6-3 193 lbs. ): Very athletic. Played wide receiver his junior year when he lost the starting QB position. Regained the starting position 3 games into the 2013 season and led the team to a bowl game. Good, smooth delivery. Didn’t get many snaps. Completed 2 of 6 for 8 yards. Roy Finch-RB-Oklahoma (5-7 167 lbs. ): Small but extremely quick. Great burst and explosion. Can cut on a dime. Surprising power for a back his size. Can break a defender’s ankles in space. Very good lateral quickness. Versatile back that can help you in the all phases of the game. Good hands. Led his team with 60 rushing yards on 14 carries. Caught 2 passes for 8 yards. Returned a kickoff 51 yards. Franklyn Quiteh-RB-Bloomsburg (5-9 208 lbs. ): Has the speed to get to the corner. Good balance. Has the ability to slip tackles. Lost his concentration when he dropped a backwards pass and allowed the defense to recover. Had 10 carries for 48 yards and 1 touchdown. Gerald Ford-WR-Valdosta State (6-3 219 lbs. ): Very good size. Has good footwork along the sideline. Had 2 receptions for 32 yards, including a 26 yard catch. Greg Hardin-WR-North Dakota (5-10 173 lbs. ): Small, but quick. Knows how to get open. Adjusts to the ball in the air. Does a good job getting inside the defender on slants. Willing down field blocker. Led his team in receiving yards with 51 yards on 2 receptions. Had a 34 yard catch. Diontae Spencer-WR-McNeese State (5-9 162 lbs. ): Has the size of a slot receiver. Determined runner after the catch. Has ability to tightrope the sideline. Separates from press coverage. Slips tackles. Able to return kicks. Had 3 catches for 29 yards and 1 TD. Tony Washington-WR-Appalachian State (5-10 200 lbs. ): Runs good routes. Natural pass receiver. Good footwork on the sideline. Very good football sense. Had 4 catches for 27 yards. Kevin Danser-G-Stanford (6-5 312 lbs. ): Good movement skills. Good size. Powerful lower body. Called for a false start penalty. Karim Barton-G-Morgan State (6-2 310 lbs. ): Powerful run blocker. Kasim Edebali-DE/OLB-Boston College (6-2 248 lbs. ): Great snap anticipation. Very good pass rusher, but needs some work defending the run. High motor. A bit light for a defensive end, so he will need to look good in linebacker drills at the Combine. Donnie Owens-DT-Winston-Salem (6-1 305 lbs. ): Pushes the pocket. Able to rush the passer from the inside. Had a QB sack/strip. Jimmy Staten-DT-Middle Tennessee (6-3 311 lbs. ): Quick off the snap. Had a tackle for loss. Sammy Seamster-CB-Middle Tennessee State (6-1 201 lbs. ): Physical. Times hits well. Brian Dixon-CB-Northwest Missouri (6-0 199 lbs. ): Good athleticism. Called for a pass interference penalty. Boo Boo Gates-S-Bowling Green (5-11 227 lbs): Good hands. Great ball skills. Has good instincts and plays in good position. Very good against the run. Quickly diagnoses plays. Good returner. Had an interception. Nick Willliams-S-North Alabama (6-2 222 lbs. ): Good ball skills. Makes plays. Reads the quarterback’s eyes and goes for the ball. Made a diving interception. Demetrius Wright-S-USC (6-0 195 lbs. ): Has the build of a free safety. Recovered a fumble. Connor Shaw-QB-South Carolina (6-0 209 lbs. ): Lacks size, but has incredible heart. Extremely tough and has played with a shoulder injury. Great leadership abilities. Good short and intermediate accuracy. Good on bootlegs. Takes care of the ball. Does not throw a great deep ball. Very tough runner. Completed 5 of 6 for 70 yards and 1 interception. Dustin Vaughan-QB-West Texas A&M (6-5 232 lbs. ): Good size. Good arm strength. Light on his feet and moves well in the pocket. Has nice touch and ball location. Completed 2 of 5 for 38 yards. Kolton Browning-QB-Louisiana Monroe (6-1 223 lbs. ): Lefty. Good poise. Nice touch. Does a good job checking the ball down. Completed 3 of 5 for 15 yards and 1 interception. Brendan Kay-QB-Cincinnati (6-3 228 lbs. ): Started the last two seasons as a backup, but then took over each year for Munchie Legaux, leading the team to two straight bowls. Has nice touch on his deep ball. Completed 3 of 7 for 51 yards and 1 TD. Trey Watts-RB-Tulsa (5-10 208 lbs. ): Son of former Oklahoma quarterback J.C. Watts. Able to start inside then bounce it outside. Breaks tackles. Returns kicks. Had 10 carries for 56 yards. Anthony Wilkerson-RB-Stanford (5-10 219 lbs. ): Patient runner. Does a good job following blockers. Runs hard. Willing to lower shoulder and take on defenders. Good vision. Good special teamer, almost getting a blocked punt. Good at pass protection. Led his team with 65 rushing yards on only 7 carries. Had a 27 yard touchdown run. James Sims-RB-Kansas (5-10 207 lbs. ): Runs well between the tackles. Has good hands and is a good outlet receiver. Carried 10 times for 43 yards and had a 20 yard reception. J.C. Copeland-FB-LSU (5-11 285 lbs. ): Massive fullback. Former defensive lineman that plays fullback with the attitude of a defensive player. Very tough to stop on straight ahead short yardage carries, but is not a threat to bounce it outside. Sledgehammer. Stones defenders as a blocker. Good hands to help out in the pass game. Good special teamer. Was selected the game MVP. Scored twice from the 1 yard line. Isaiah Burse-WR-Fresno State (5-10 185 lbs. ): Dynamic in space. Despite his lack of height, he is able to climb the ladder on high passes. Fearless. Very good returner. Had 4 catches for 50 yards and had 1 dropped ball. Asante Cleveland-TE-Miami (6-4 262 lbs. ): Very good size. Catches the ball at its highest point. Has the speed to get deep. Had an impressive 27 yard TD catch. Jamie Meder-DT-Ashland (6-2 306 lbs. ): Has the body type to play 3-4 defensive end. Quick off the ball. Does a good job shedding blockers. Makes plays. Had a batted pass and a tackle for loss. Khyri Thornton-DT-Southern Miss (6-2 301 lbs): Gets good penetration. Gives great effort. Strong and able to dominate at the point of attack. Quick first step. Uses his hands well. Shaun Lewis-LB-Oklahoma State (5-11 226 lbs. ): Not very big. Good pass defender. Good concentration. Had an interception off a tipped ball. Howard Jones-LB-Shepherd (6-2 229 lbs. ): Good hustle. Good awareness. Recovered a fumble on a backward pass. Stephon Robertson-LB-James Madison (5-11 220): Breaks down well to make the tackle in the open field. Good form tackler. This entry was posted on January 23, 2014 by draftmaniacs in All-Star Games and Combine and tagged 2014 NFL draft, 2014 nflpa collegiate bowl, J.C. Copeland, NFL Draft.